These six black and white photographs show the progress of the construction during the summer of 1953. This was on the 'East Campus' which developed around the original farmhouse location of the Clinic. 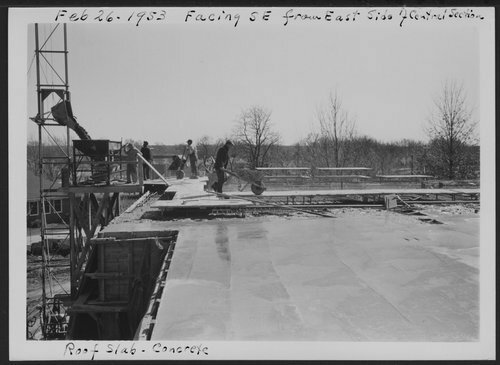 These photographs document the construction of an important building in the Menninger philosophy of treatment, constructed to fit the treatment of the patients. In 1982, the "West Campus", a much larger area, was developed west of Topeka, a residential scale community of 28 structures on a 350 acre hilltop campus. In 2003, the Menninger Foundation was moved to Houston, Texas.